Wondered where that plane up above is going - Wonder no more! 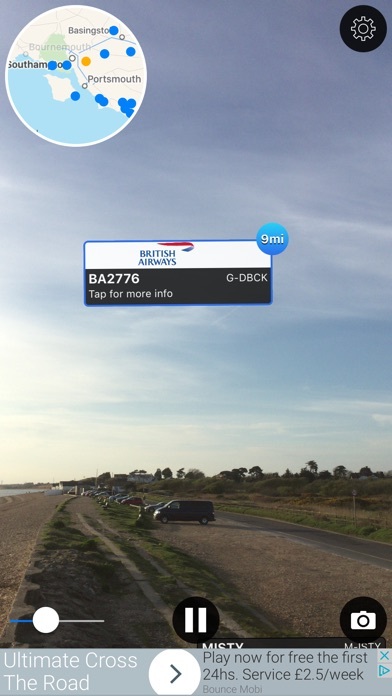 Plane Finder AR Free - Point the camera at a plane and you'll see the flight number and how far away it is! Amaze your friends with your newfound knowledge! Those trails across the sky will no longer be a mystery! If you like this app then you'll love the full version! For a one off purchase Plane Finder AR will give you: • Airline Logos • Destination Airport • Departure Airport • Aircraft Speed • Altitude • Aircraft Registration • Options for the range finder, choose miles/kilometres etc. 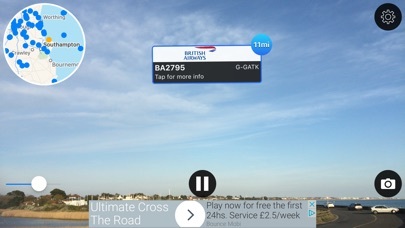 • No external adverts Plane Finder AR is the original and best Augmented Reality plane tracking app. We are proud to have been featured by CNN, GMA, UK Sunday Times and many others. Don't take our word for it either - check out our AppStore ratings and the wide range of positive press we've had across the world. 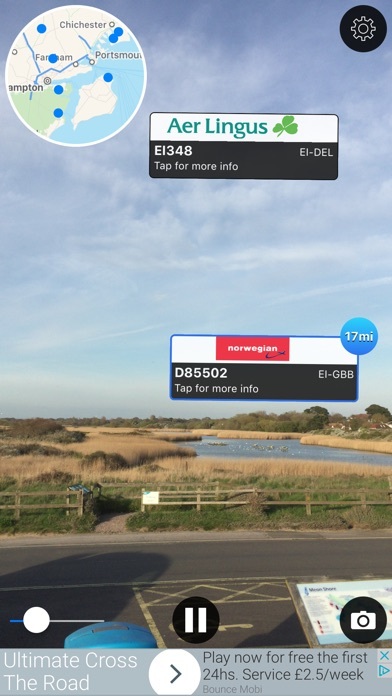 Plane Finder AR blends the data from our Plane Finder virtual radar apps with the Augmented Reality capabilities of your iPhone or iPad to show you what is flying overhead. The app is fun to use and is very dynamic. It will work in all areas for which we have coverage. Please check our web map at http://www.planefinder.net or ask a question via support@planefinder.net to make sure we cover your area. Our global coverage is impressive and growing all of the time too! Why not also check out our Plane Finder and Plane Finder 3D apps for an amazing radar like view of the air traffic across the world. Frequently Asked Questions What is the difference between Plane Finder AR and Plane Finder? 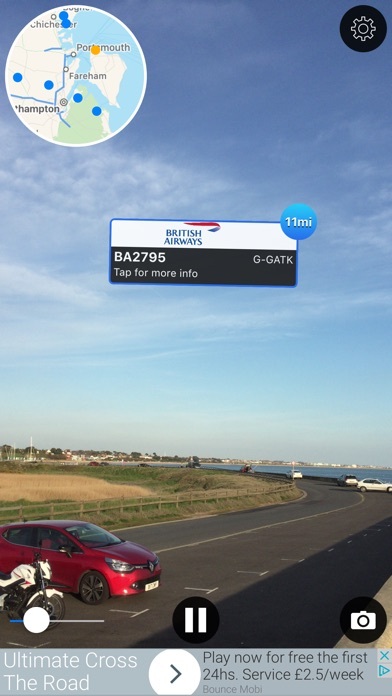 Plane Finder AR is our augmented reality app that shares the data available in Plane Finder- our original iPhone App. Plane Finder provides a near real time virtual radar view of flight from across the world and include a great deal more detail that Plane Finder AR. All Plane Finder apps share common ADS-B data. Why can't I see all planes? Aircraft must be carrying ADS-B equipment and we must have a feed in the area. (In the US airlines have been slow to adopt the technology but usage is continuing to rise). What if my area isn’t covered? We are always on the lookout for more data feeds. Check back regularly to see if we have added your area. You could even help us by running a free receiver! If I have an ADS-B receiver can I share my data for use with Plane Finder AR? Yes. Please contact support@pinkfroot.com and we will assist. Can I use Plane Finder AR for navigational purposes? Definitely not. Plane Finder must not be used for navigational purposes under any circumstances **Whilst we do have the best network please double check coverage using our free app Plane Finder Lite to make sure that we have coverage for your area** Disclaimer: The use of the information presented using Plane Finder is strictly limited to your pursuing enthusiast activities (i.e. for entertainment purposes), which specifically exclude any activities that might endanger yourself or the lives of others. Under no circumstances will the developer of this application be held responsible for incidents resulting from the use of the data or its interpretation or its use contrary to this agreement.